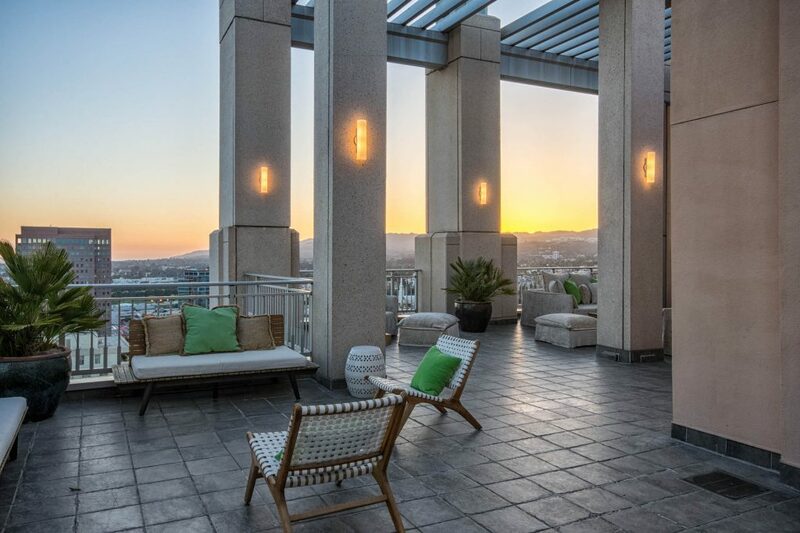 High atop one of the most sophisticated residences in the Wilshire Corridor, The Remington’s 27th-floor Penthouse 5 rises worlds beyond condominium living. This is a true private estate, with nearly 6,000 square feet of elegance surrounded by breathtaking views that sweep across the city to the ocean beyond. Step directly from the elevator into your private foyer and prepare to be astonished by the soaring two-story living room, where three sets of sliding glass doors open to a spacious deck surveying the city below. Many more dazzling vistas await on the dramatic outdoor terrace, measuring some 1,800 square feet – an exceedingly rare commodity in high rise living. Magnificent entertaining starts here, then moves to the intimate dining room served by a gourmet cook’s kitchen with charming breakfast banquette. 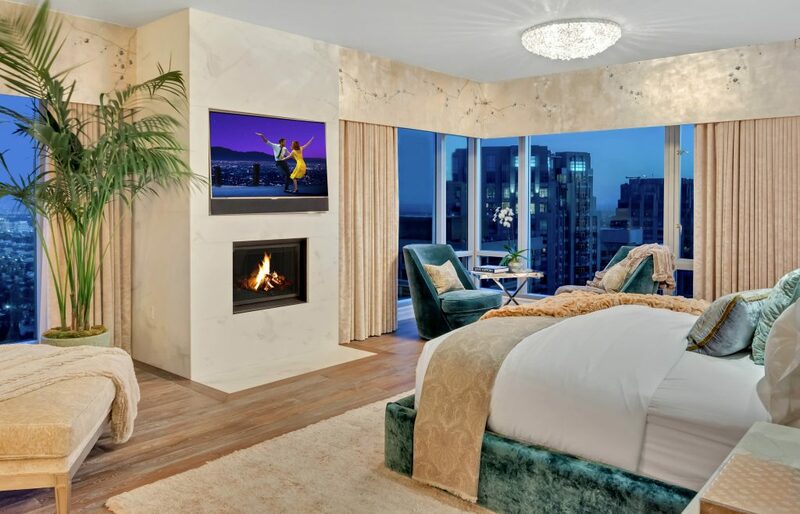 In the vast master suite, luxurious handcrafted wall coverings, a marble fireplace, sumptuous dual baths and a star-worthy closet set the opulent tone. 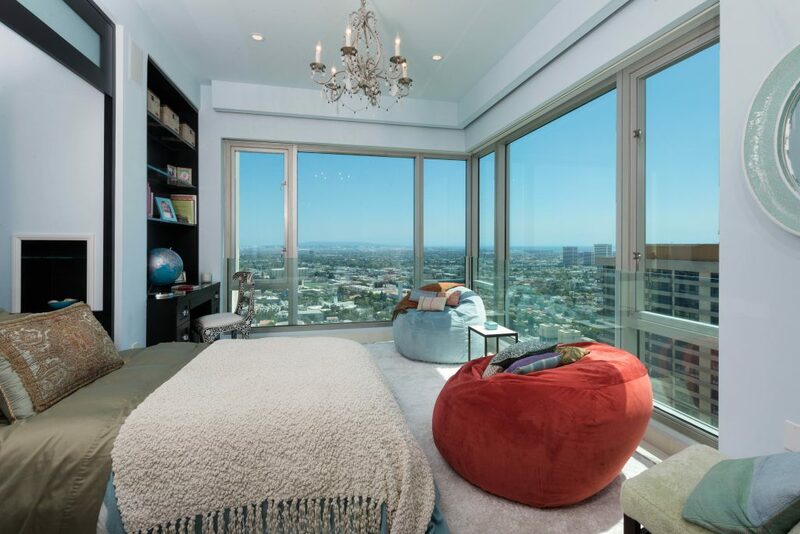 There are two additional bedroom suites, along with a whimsical “glass-walled” fourth bedroom with stunning views. A power office suite commands more penthouse level vistas. Every facet of this world-class residence is exquisitely designer envisioned and lavished with the finest finishes, fixtures and details. The Remington’s luxurious amenities include a palatial reception hall, private residents’ library with fireplace, entertaining salon with catering kitchen, private temperature-controlled wine storage, and elegant grounds. 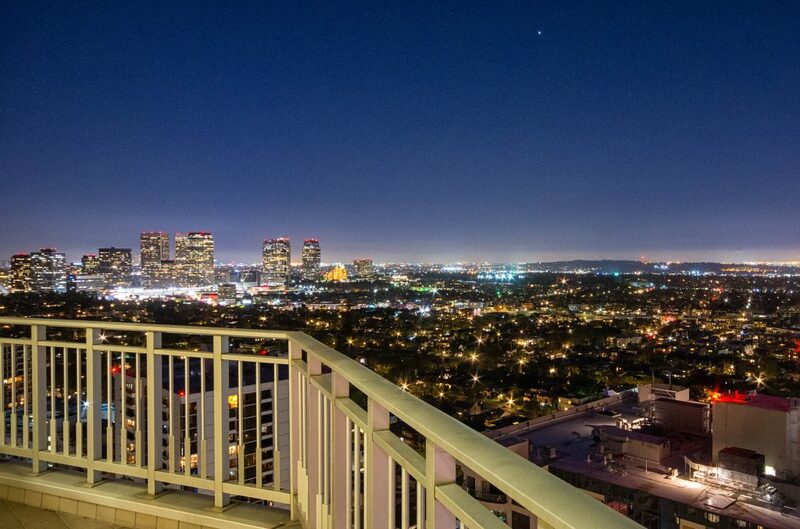 Your retreat in the sky is steps away from Westwood Village shopping and dining, and moments from Beverly Hills. The residence at 10727 Wilshire Boulevard has been listed by Greg Holcomb and Cassandra Petersen at $15,950,000.